Microsoft is working with a new technology that lets us use our hands as touchscreens to send commands to a computer. Named Skinput, the device, is being built with help from researchers at the Carnegie Mellon University and Microsoft. Skinput is really an interesting concept and technology. It uses different sounds emitted when we tap various parts of the skin to figure out what icons or menus are being tapped. 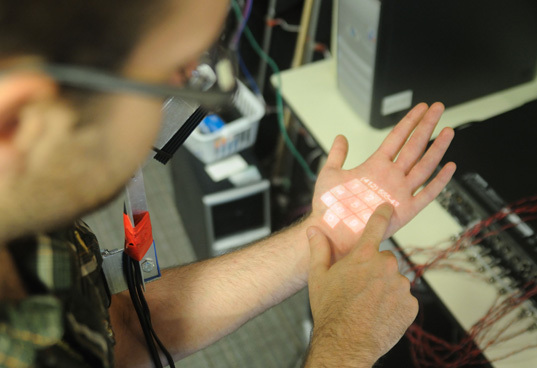 The display is illuminated on the skin and are called “Skin buttons” while five piezoelectric cantilevers detect sound frequencies to respond to them. The system is being tested and it works well with a 95.5% accuracy comparable to the same as many touchscreen devices. No word on when this might be actually out of testing and into production but this could definetely give us an escape from touch screen devices. 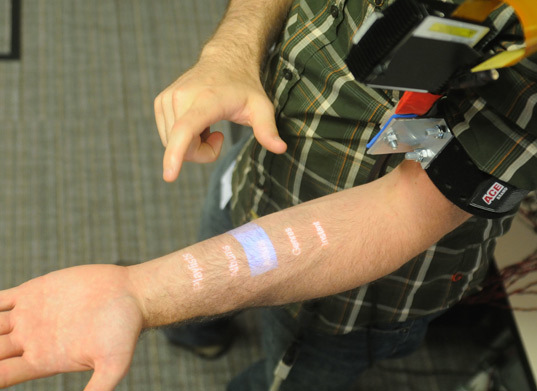 CNN reported that a pico-projector is used to display the digital keyboard on a person’s forearm. Using this system a user could send a text message without actually typing on the phone. But there are critics who question the usability of this technology while we look at it as progress towards holographic image display technology. Microsoft Working on TouchScreen on your Hand!